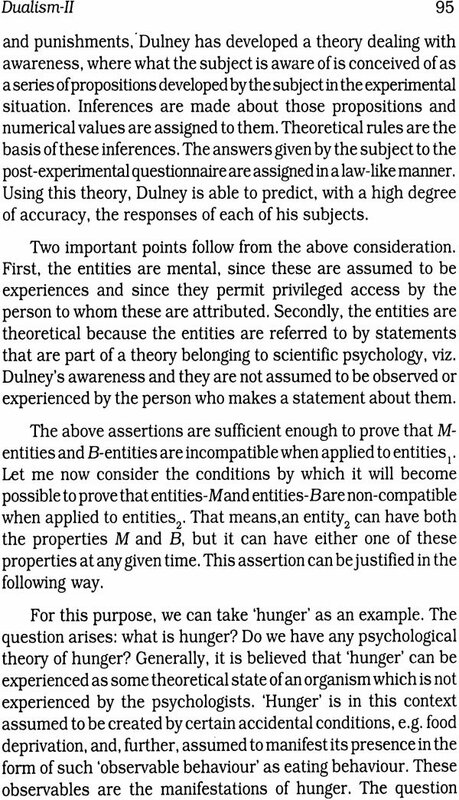 How dowe (basically) conceptualize a human being or, say, any 'person'? Is he just his 'body'? Or a 'mind' too - besides his 'body'? What, then, is 'mind', or how is it related to 'body'? And since 'body' is destructible, does man have 'disembodied existence' as well? Addressing these age-old questions of fundamental importance, the book focuses on mind-body dualism. Which, despite its exposure to scathing criticisms, and even outright repudiations, has survived as a powerful dualistic tradition. 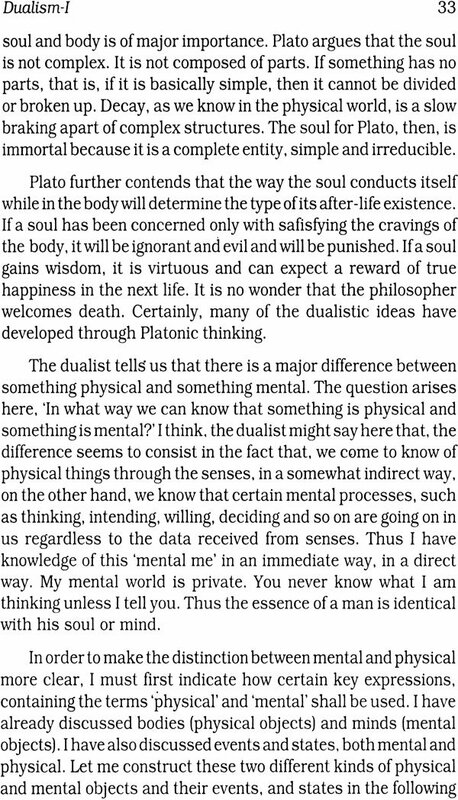 Alpana Chakraborty's study is not a critique of mind-body dualism; but a coherent, quintessential review of the philosophical thinking that has, since Descartes' time, been invested in the shaping of this dualistic tradition, its theoretical parameters and its key issues. Also setting out Western concepts of 'person', 'disembodied existence/survival', and 'bodily resurrection', the author considers the Cartesian view of mind-body dualism, and how it compares with the dualism of traditional Indian Samkhya philosophy. In her effort to spell out issues central to mind-body interaction, Dr. Chakraborty develops a vast historical framework from the acknowledged treatises/theories of Cottinghum, Don Locke, Gillbert Ryle, C.D. Broad, C.J. Ducasse, Nichlos Bohr, P.F. Srawson and other Western philosophers - including the very recent theories of 'Complementarity' and 'Meta-Linguistic Dualism'. 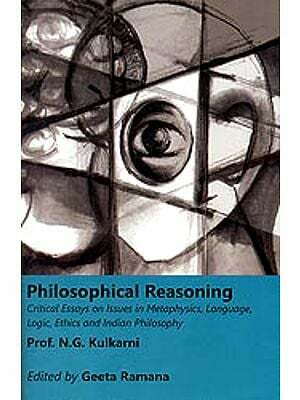 Invaluable to the scholars of philosophy, metaphysics and psychology. Alpana Chakraborty holds M. Phil and Ph.D. of the North-Eastern Hill University (NEHU), Shillong. And is currently Lecturer in Philosophy at the NEHU-affiliated St. Anthony College. A scholar with varied areas of interest and also member of several academic bodies, Dr. Chakraborty writes in both Bengali and English on different themes that range from mind-body dualism to existentialism. I am well aware of the fact that, there is no dearth of materials as far as this problem is concerned. However, in my opinion, most of these materials are critical rather than appreciative of this problem. I have, therefore, made an attempt to appreciate this problem in my own way. Needless to say that the dualist tradition still remains powerful and perhaps will remain so far all time to come. 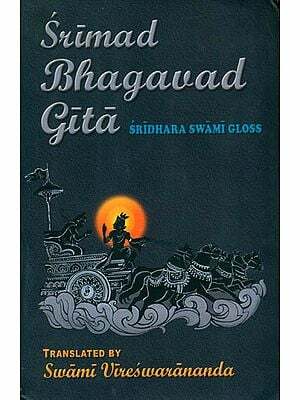 There are five chapters in this book, namely (1) Dualism-I, (2) Dualism-II, (3) The Concept of Disembodied Existence, (4) The Concept of Person, and (5) The Dualism of Samkhya. 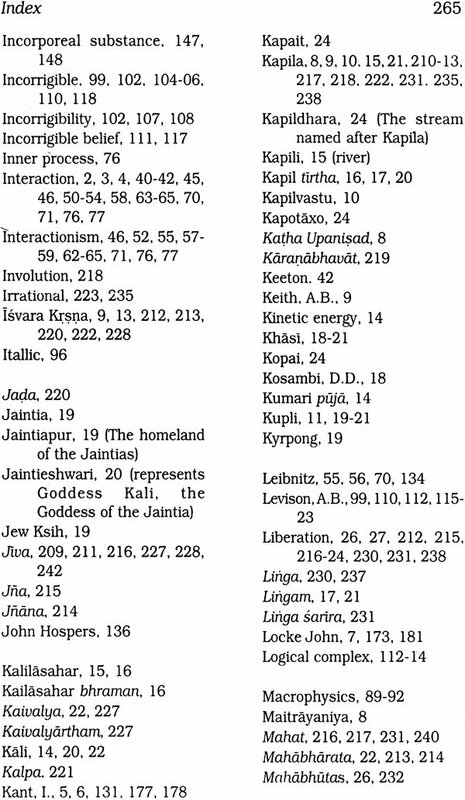 I think, my allotting two chapters to dualism has been amptly justified by the availability of enormous amount of literature regarding the same. The first two chapters consist of the nature of the problem of mind-body dualism. 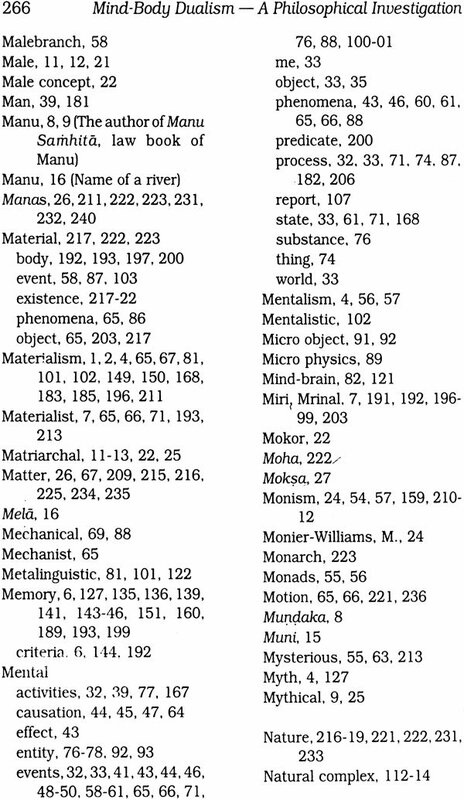 In these chapters, I have discussed thoroughly some of the most modern theories of mind-body dualism. The third chapter takes up the question of disembodied existence. This chapter also discusses the belief in survival after the death of the body. An attempt has been made in this chapter to raise certain questions hitherto unasked, and to answer such questions. The fourth chapter tries to answer the vexing question 'What is a Person'. In this connection, the positions of P.F. Straws on and M. Miri have been given a prominent place. 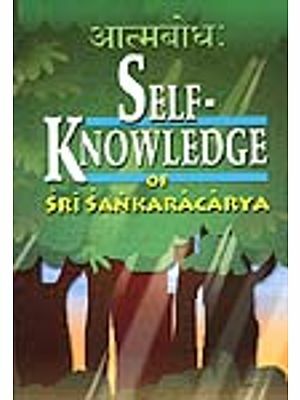 The fifth and the last chapter deals with the dualism of Samkhya with that of Cartesian Dualism. I have given conclusion for each chapter in which I have indicated my considered opinion. It gives me great pleasure to acknowledge my indebtedness to Dr. S.C. Daniel of Department of Philosophy, North-Eastern Hill University, Shillong, Meghalaya for giving me encouragement and valuable advice whenever needed most. I am specially thankful to my teacher, Professor Mrinal Miri for his valuable advice and suggestion when ever needed. I take a special opportunity to thank Professor J.B. Bhattacharjee for his valuable advice, encouragement and suggestion for writing this book. I would like to place on record my special thanks to my brothers Chittaranjan Chakraborty and Tarun Kumar Chakraborty and to my sisters Kalpana Chakraborty and Aparna Chakraborty for their untiring support. 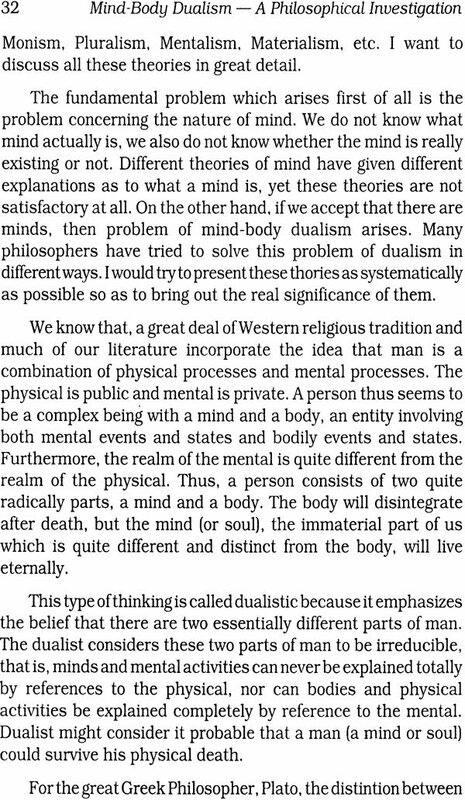 A Great deal of work has already been done by many distinguished philosophers on mind-body dualism. However the main aim of most of the philosophers seems to be highly critical rather than appreciative of this approach. But in spite of these criticisms I find that. the dualist tradition remain a powerful tradition and it therefore deserves a fresh philosophical look. I have therefore made an attempt to consider certain central problems of philosophy which Mind-Body Dualism tries to tackle. In this book, I shall concentrate primarily on the following issues which arise in the context of the general dualist tradition. 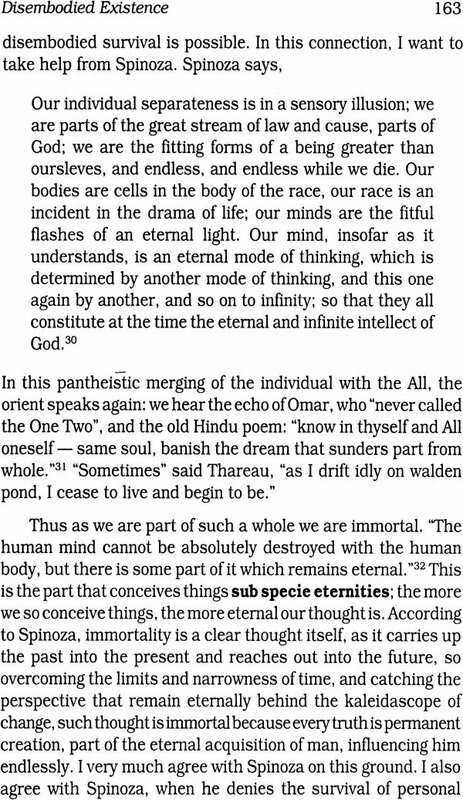 There are five chapters in the book, namely (1) Dualism-I, (2) Dualism-Il, (3) The Conept of Disembodied Existence. (4) The Concept of Person, and (5) The Dualism of Samkhya. My original plan was to have just one chapter on Dualism. But, since materials available on Dualism is so vast that. I decided to have two chapters, instead of one, namely Dualism-I and Dualism-II. The arrangement of arguments. I think, would amply justify my decision. 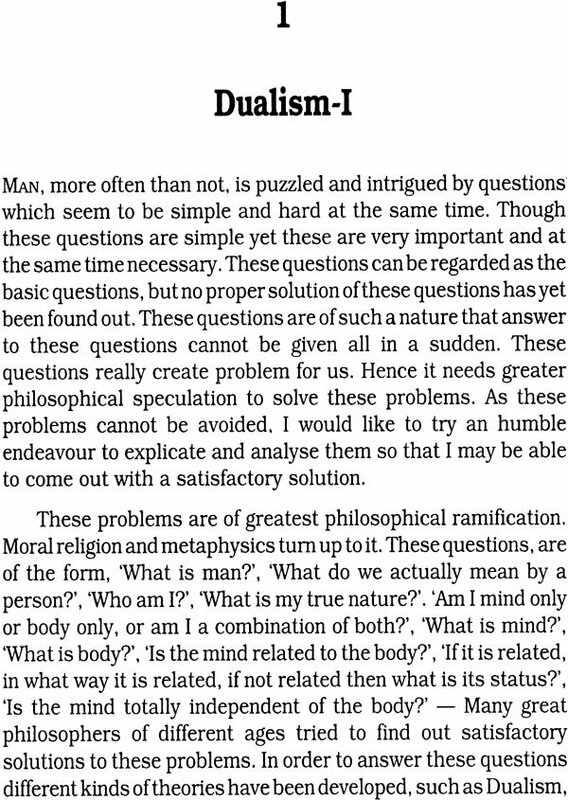 These problems are of greatest philosophical ramification. All moral, religious and metaphysical questions revolve around them. Many great philosophers of different ages have tried to find out satisfactory solutions to these problems. I have discussed all these problems in great detail. Regarding the nature of man. different kinds of interpretation are available. Some philosophers have maintained that human being is simply his body and nothing else besides. This position may be loosely termed as Materialism. According to Thomas Hobbes, human being is nothing but his body, and soul is only the name of something in the body. This kind of materialistic position is also held by the Carvakas. Feuerbach, a German Philosopher, echoes the same view by saying that 'a man is what he eats'. 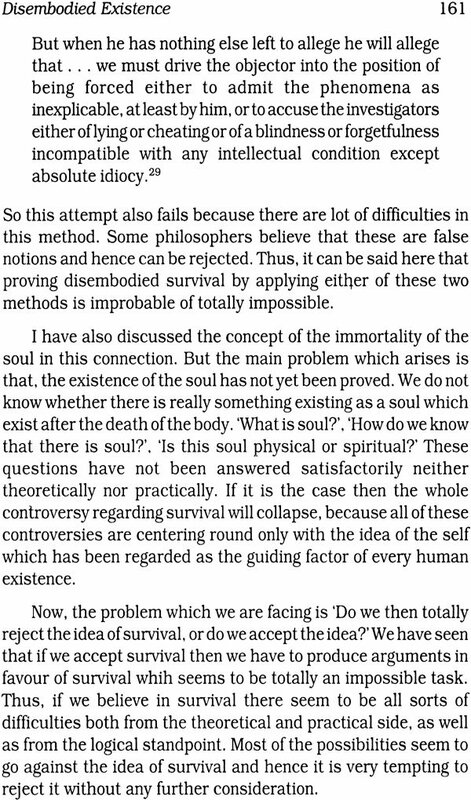 However, many a philosopher and specially those with religious background, have argued that human beings are something more than their bodies: and this something has variously been referred to as the mind, the self or the soul. 'Is human being really a mind?' 'If he is, what exactly is this mind, and how is it related to the body?' These questions and the possible answers to these questions have been taken up in the first two chapters. 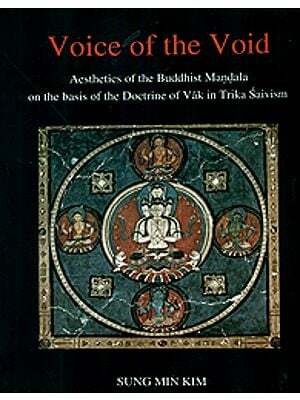 These chapters deal mainly with the problems involved in Dualism. 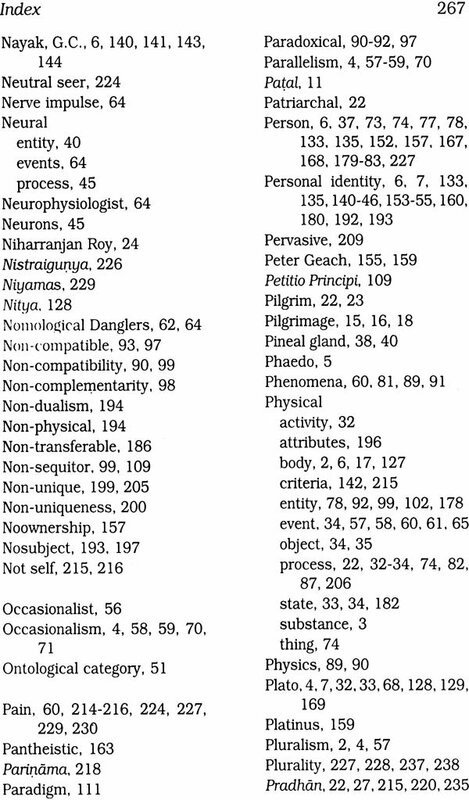 They give an introductory survey of the nature of the problem of mind-body dualism. Though this problem has been there since time immemorial, I feel that, certain new insights can be brought to bear upon this problem. What is dualism?' 'How does it differ from Monism, Pluralism and Materialism?' These questions and their plausible answers are also taken up. At first sight, it seems quite plausible to contend that a human being is something over and above his body. It also seems plausible that there are causal connections between the mind and the body. Philosophers who assert that there are causal influences in both directions, i.e., mind not only acts on the body, but it is also being acted upon by the body are known as 'Dualistic interactionists'. All the forms of dualistic interactionism have been considered and examined thoroughly. 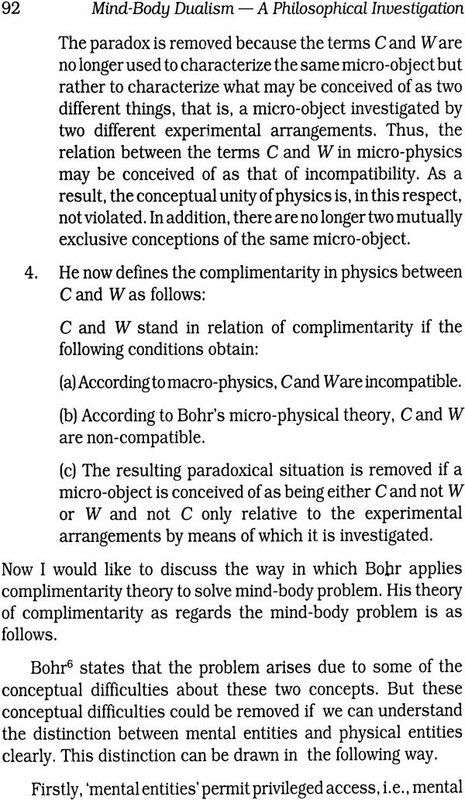 The question, whether interactionism conflicts with the law of conservation of energy, has also been discussed thread-bare. Epiphenomenalism as a rival to interactionism has been studied in detail. Dualistic interactionism states that, a human being is something over and above his physical body, i.e., a human being has both a body and a mind. Body is physical but mind is spiritual. Body is public but mind is private. Body is subject to change and destruction, whereas mind is unchangeable and indestructible. Further, the realm of the mental is quite different from the realm of the physical. Thus a person consists of two radically different parts, a mind and a body, and both the mind and the body are causally related to each other. Such a view has been propounded by Rene Descartes. Descartes' view is as follows: there is only one ultimate substance and that is God. Further, there are two created substances which are known as Mind and Matter. Mind is a spiritual substance. Thinking, feeling and willing are the essential attributes of the mind. Body is a physical substance. Extension, figure and motion are the essential attributes of the body. Both mind and body are totally different from and independent of each other, yet there is a causal interaction between them. Descartes' theory that mind is a kind of spiritual substance and his theory of mental-physical distinction have been criticized by Gilbert Ryle in his The Concept oJ Mind. 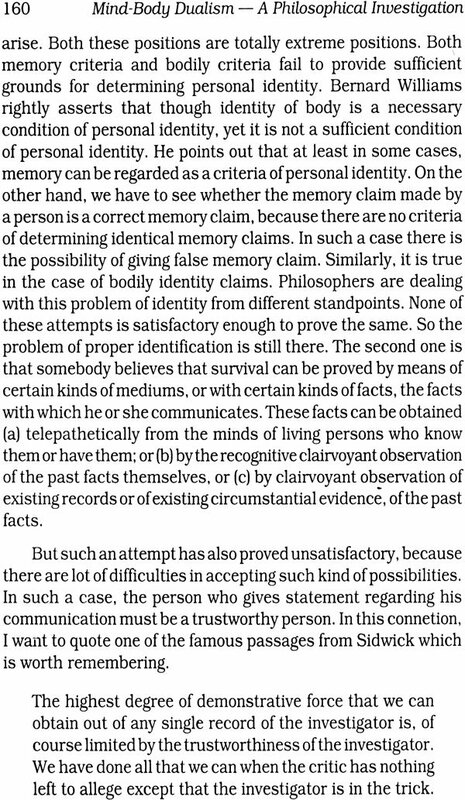 Ryle argues that Descartes' theory leads to a kind of myth about the nature of the 'mind' and that, Cartesian theory involves one big mistake of a special kind, namely, the 'category-mistake'. Ryle's comments on Descartes' theory have been critically discussed in this chapter. Descartes' theory has also been criticized by two of the contemporary philosophers. Namely, John Cottinghum and Don Locke. These criticisms have been discussed in detail in these chapters. Descartes' theory of causal interactionism is subject to different sorts of criticisms. 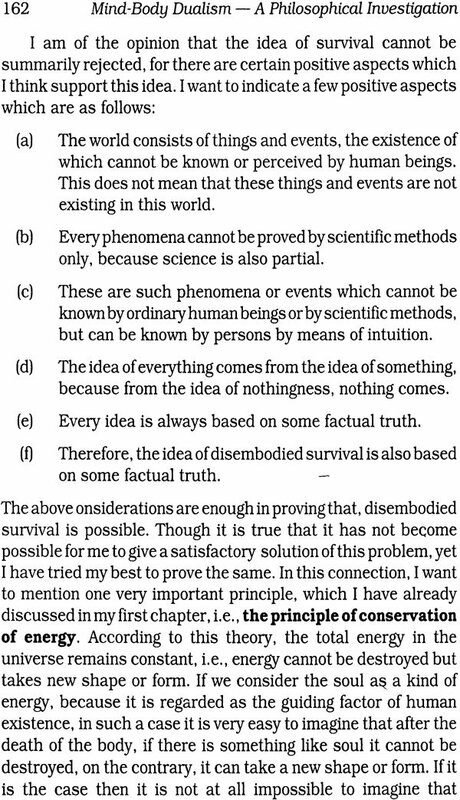 Generally, there are two lines of attacks on Descartes' theory of causal internism, and these are from the requirements of scientific and philosophical investigations. Both scientific and philosophical criticisms have been, in turn, criticized by two of the defenders of Descartes, namely C.D. Broad and C.J. Ducasse. 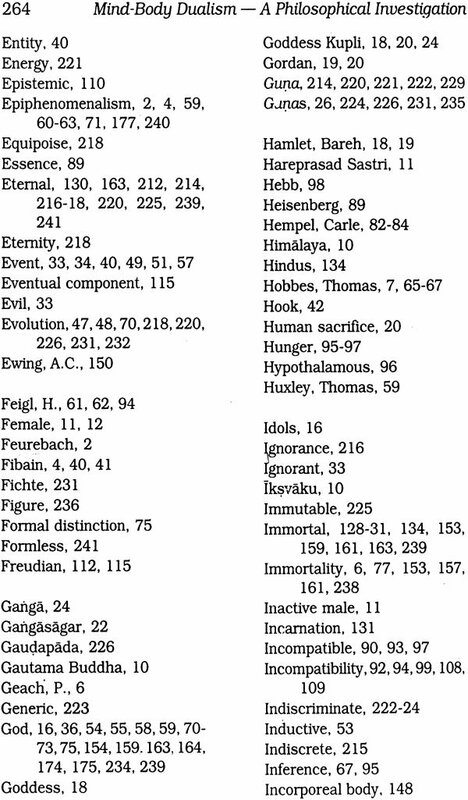 Their views are elucidated in the books, The Mind and its Place in Nature and Nature, Mind and Death, respectively. The views of these two philosophers are discussed in detail in this chapter. Further, Descartes' theory of causal-interaction has been rejected by many theories. 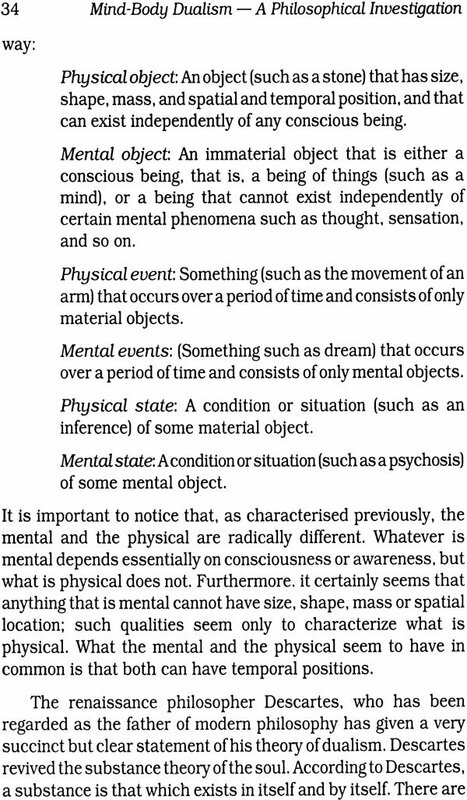 These theories are known as Monism, Mentalism, Pluralism, Parallelism, Occasionalism, Epipheno- menalism and Materialism. 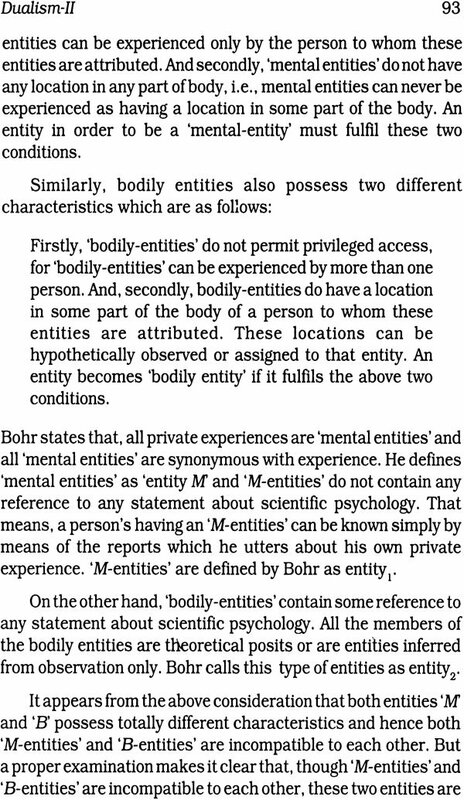 Behaviourism and mind-body identity theory are also given their due place. All these theories are critically discussed in these chapters. 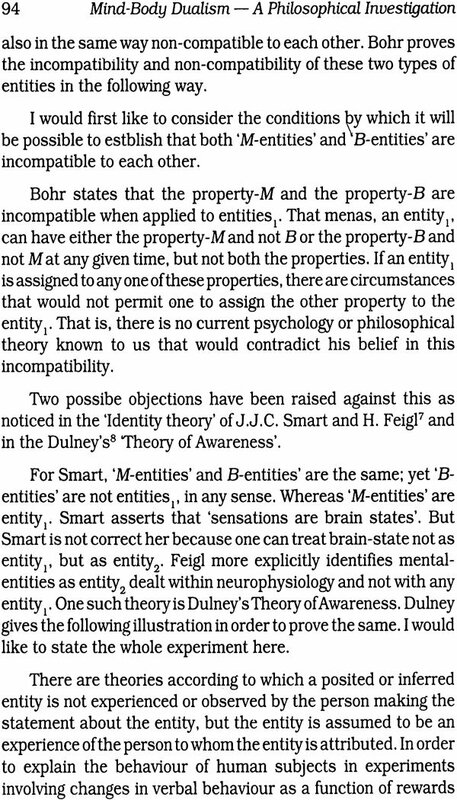 In order to overcome the difficulties of Deacartes' theory of causal interactionism, a more recent theory has been developed which is known as The Neutral Version of Identity Theory'. This theory does not deny both 'dualism' and 'interactionism' but it gives a new interpretation in order to avoid the difficulties of dualism by introducing a new term 'fibain'. This new theory is given a prominent place in these chapters. I have also discussed two of the most recent theories on Mind-Body Dualism developed by two of the most influential philosophers, Nicholas Bohr and Richard Rorty. These theories are known as ‘The theory of the complementarity and Mind - Body Dualism' and 'Metalingutstic Dualism' respectively. These two theories are critically discussed in these chapters. The question, 'Are there any good grounds for supposing that the mind of a human being survives his body?' Or, the question of disembodied existence is taken up in the third chapter. This problem has a long history. Since the time of Plato the discussion of disembodied existence has been conducted by the greatest minds upon the highest levels of human thought. Nevertheless, the problem still continues to excite the minds of philosophers. This perennial problem has been evoking extreme responses from philosophers.